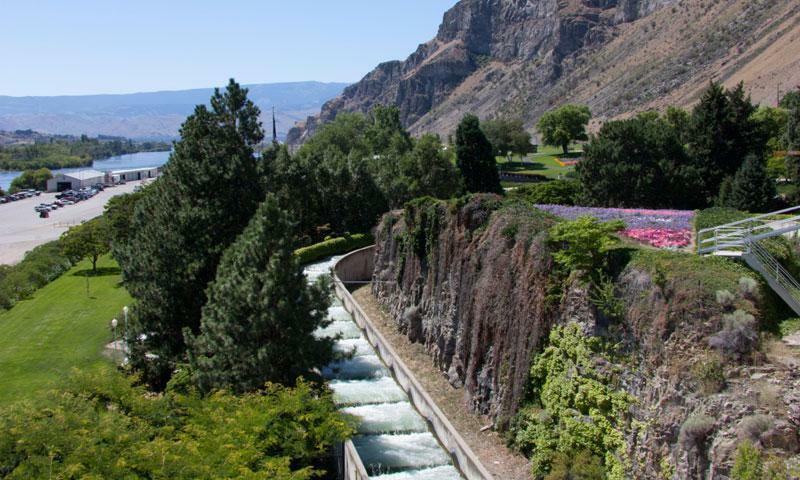 Enjoy the natural beauty of the surrounding Columbia River and the public parks while learning about the fish bypass system and dam when you visit the Rocky Reach Dam Visitors Center. What can I see and do at the Rocky Reach Dam? At the Rocky Reach Dam and Visitors Center you can visit their museum, café, and playground. They have several balconies that overlook lush parks, a fish bypass system to watch the salmon swim in, a movie viewing area for educational films, and access to the reservoir and Columbia River. Where is the Rocky Reach Dam? The Rocky Reach Visitors Center is located about 25 miles East of Leavenworth. Follow US 2 East as it turns into US 97 North. Take exit US 97 Alt N/Euclid Ave and the Visitors Center will be on the right. When is the Rock Reach Dam open? Rocky Reach Dam is open seven days a week from 9:00 am to 4:00 pm. How much does it cost to visit the Rocky Reach Dam? Visiting the dam is free for all ages. Fore more information about the Rocky Reach Dam Visitor Center call (509) 663-7522. Pretty cool - experience Washington's version of Stonehenge.